Craving the sweet taste of the holidays? 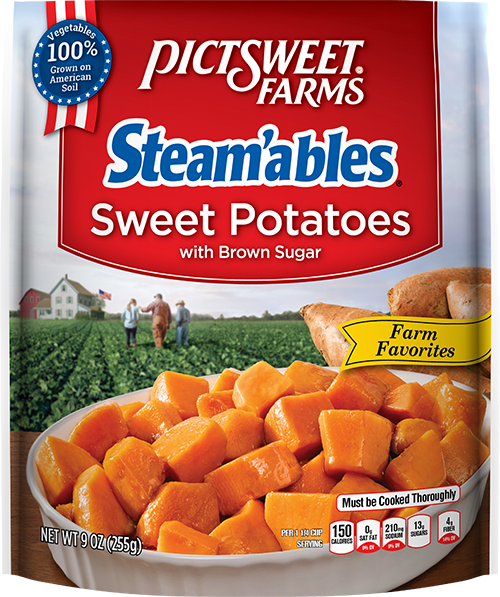 Enjoy Pictsweet Farms Sweet Potatoes with Brown Sugar all year long! They feature southern sweet potatoes with real premium brown sugar for a delicious flavor everyone loves. 100% grown on American soil and ready in the microwave in just minutes! Microwave ovens vary in power. Cooking times are approximate. Sweet Potatoes, Brown Sugar, Maltodextrin, Salt, Modified Butter Oil, Dehydrated Butter, Guar Gum, Sodium Bicarbonate, Extractives of Annatto and Turmeric. CONTAINS MILK INGREDIENTS.